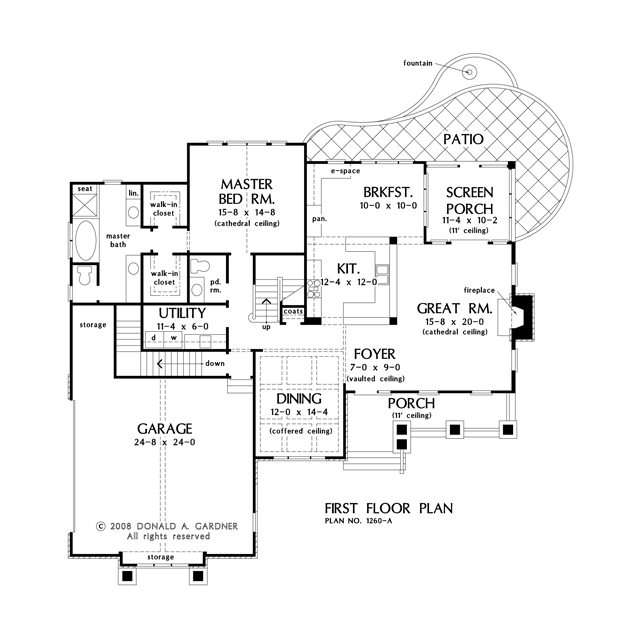 This charming, two story European style home offers outstanding curb appeal with a functional, yet elegant floor plan. The large foyer opens into the great room with cathedral ceiling and fireplace. The gathering space enjoys easy access to the open kitchen providing convenience and openness to the floor plan. The spacious breakfast room is surrounded by windows and offers an e-space for looking up recipes, doing homework or charging electronic devices. The dining room is open to the kitchen and great room, but is defined with a stylish coffered ceiling. A secluded master suite completes the main level with dual walk-in closets and separate vanities in the bath. The second floor has two more bedrooms, a large bathroom, and a spacious bonus room lit with skylights. 1st Floor: 1713 Sq. Ft. Bonus Room: 745 Sq. Ft.
House Dimensions: 63' 2" x 56' 6"
Great Room: 15' 8" x 20' 0"
Master Bedroom: 15' 8" x 14' 8"
Patio - Rear : 36' 0" x 10' 8" x 0' 0"
Porch - Front : 23' 2" x 6' 0" x 11' 0"
Porch - Screen : 12' 2" x 11' 0" x 11' 0"
Bedroom #2 (Cathedral): 12' 0" x 12' 0" x 11' 8"
Bedroom #3 (Vaulted): 12' 0" x 12' 2" x 12' 10"
Bonus Room : 24' 8" x 14' 10" x 9' 0"
Dining Room (Coffered): 12' 0" x 14' 4" x 9' 0"
E-Space : 6' 0" x 5' 8" x 9' 0"
Foyer (Vaulted): 7' 0" x 9' 0" x 21' 2"
Garage Storage : 9' 4" x 6' 4" x 0' 0"
Garage Storage Bay : 11' 0" x 1' 8" x 0' 0"
Great Room (Cathedral): 15' 8" x 20' 0" x 22' 2"
Master Bedroom (Vaulted): 15' 8" x 14' 8" x 13' 8"